I couldn’t quite muster the oomph to blog yesterday. I was doing too much actual knitting. I have four sweaters at various stages in progress right now and I’m trying to bust out the bulky one. It grew by 5 inches yesterday. Bulky yarn is my friend. But that’s not what I’m here to tell you about. Five inches of stockinette is not that interesting. Cables are interesting and boy do I have some cables for you. That, my friends, is Iced Hat by Irina Dmitrieva. 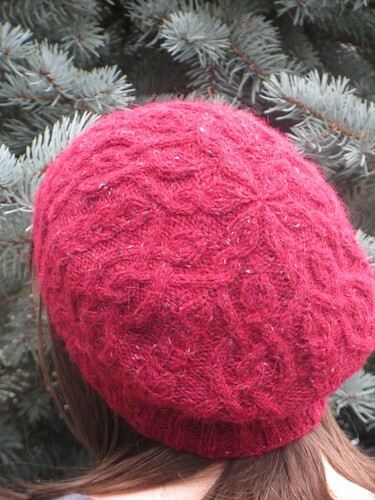 I bought her whole Cabled Hats 3 collection the minute I saw it. They are all lovely cable-y masterpieces. So many cables, some rounds have as many as 36 cables per round. I made mine out of Rowan Felted Tweed in the color “150”. Felted Tweed is 50% merino, 25% alpaca, and 25% vsicose. It’s a little crunchy when you’re knitting with it, but it softens up SO much when you wash it. It also weighs next to nothing. Each 50g ball has 198 yards! I got the whole hat out of one ball. 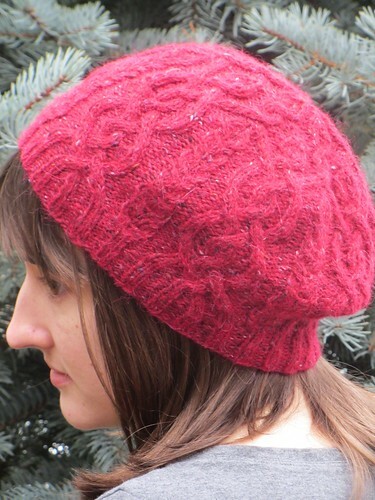 It’s light and airy to wear but still nice and warm because of the merino and alpaca. 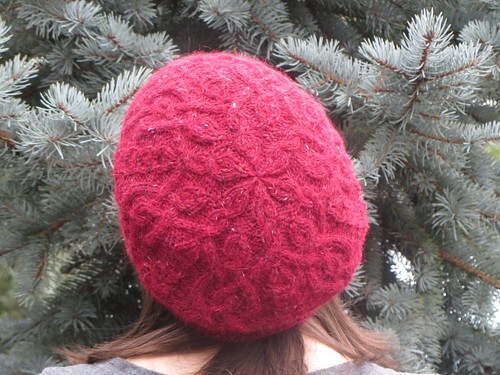 I blocked mine around an 11″ dinner plate to get a nice beret shape. 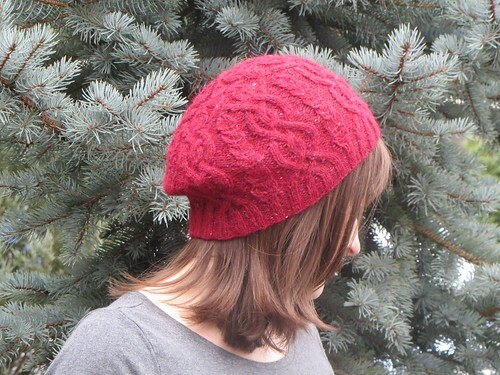 Looking at the projects on Ravelry, it looks like quite a few people have left it in more of a beanie shape. It looks cute both ways. I’ve had it done for about 3 weeks and I’ve worn it about 15 times. I am still dutifully reading Jonathan Strange and Mr. Norell but I’ve thrown in an audiobook of Black Sun Rising by C. S. Friedman to give myself something a little more exciting. It’s the perfect sort of blend between Science Fiction and Fantasy, if you’re into that sort of thing. really lovely! i’ve not made a hat for myself yet, but then, i dont find many occasions to wear hats. love the colour and the cables! !